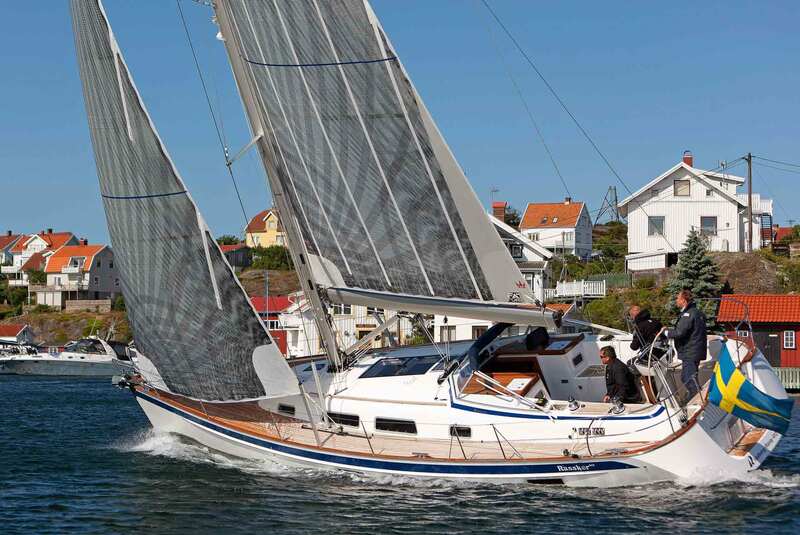 I do own a King´s Cruiser 33, as you may have read in my previous articles, a fine sailing yacht drawn by Swedish national hero Pelle Petterson (who, besides, is still designing yachts for Maxi), made by Fiskars of Finland back in the mid-Seventies. Reading all I can grab about sailing yachts since months now – books, brochures of new yachts or browsing time and again the various websites of boat builders as well as sailor´s blogs – it´s a constant dream of owning a shiny brand new boat that all of you might experience at some time. But, even if I´d had the budget to go forward and simply get one: Which one to buy at all? Here it seems that there are indeed differences of approaching the topic of “sailing” when looking at different yacht brands and even countries or areas. I am very honored of having the chance to talk to Niels Jeppesen of X-Yachts, Magnus Rassy of Hallberg-Rassy and Danish pro-sailor Nicolai Sehested to maybe get a hint ond the “Scandinavian Style” of building seaworthy yachts and their a approach to sailing as a whole. Is “Style” attached to “Area”? I do think, of course it is! Just take a look at China-built junks of the past, the fantastically seaworthy outrigger canoes of Polynesia or the classic Baltimore Clippers of the Eighteens Century: Boatbuilding was and still is always a matter of where the boats are made too. Clearly the regional predominant weather conditions do have a major impact in how the ships are designed, what kind of rig is utilized and all assorted questions a ship designer of the past had had to find an answer to – still like today. A ship made to batter against the strong headwinds of the North Sea and Atlantic Ocean has to look different than a small canoe made for sailing the relatively fine and steady winds of the trade-belts in the Pacific. Hallberg-Rassy is among the most prestigious yacht brands. Even when looking at Europe´s yacht builders of today one might find different aspects in the very construction of the boats as well: To have a closer look at a Scandinavian approach this article is dedicated to, another one is in preparation – I do speak to two renown French boat builders as well as one pro sailor again and yet another article on a German approach is in the making. I am a great fan of Copenhagen and Denmark as well – not only do I like the countryside and the friendliness of the people, I really love the idea of a country having both the roughness of the North Sea to its West and the beauty of the Baltic Sea to its East. With Sweden, it´s a fascination of an utter beautiful country, the archipelago coast with thousands of islands and a welcoming, open culture as well. 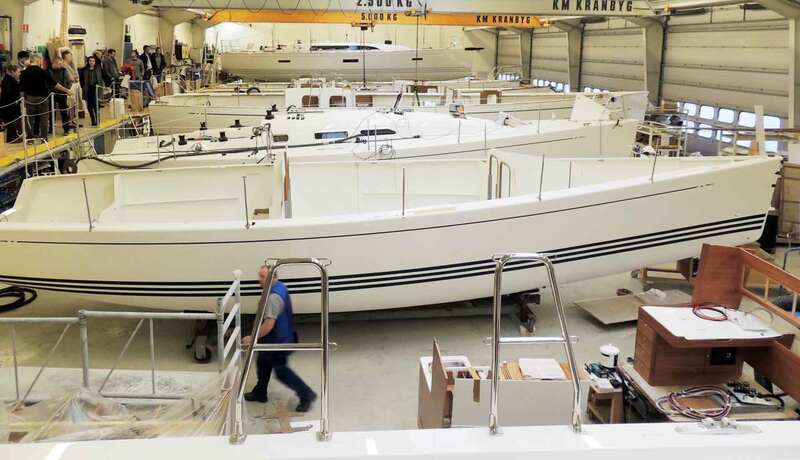 Some X-Yachts nearing completion in Haderslev/Denmark. NO FRILLS SAILING.com: Would you three please give some hints about your background, how you came to sailing and finally building boats – or racing them respectively, please? Niels Jeppesen: I did grow up in the southeast of Denmark in Stubbeköbing. There was a local boatyard, Nimbus. Building up to 33 feet yachts at that time. I came to sailing through my parents who used to take me with them on their cruises. We´ve had plenty of boats, a 27 feet Vega, a Singoalla and 32 feet Ballad, one Grinde and finally a Farr yacht. For me, sailing is getting close to real nature. I think Scandinavian waters are among the most diverse and beautiful in the world. Magnus Rassy is the second generation of the well known Swedish brand. Magnus Rassy: For me it´s the same love for the waters as with Niels: I have been on the water as long as I can remember. I can very well see myself as a young child drawing all the time: Mostly, when I was drawing and painting something, it have been boats. I learned over the time that a good sailboat does possess a heart and a soul indeed. When we went out to sail it was always this enjoyable feeling of total freedom I like the most. Nicolai Sehested: Amongst us three, I fear I am the youngest, 26 years of age by now. I do live in Copenhagen when not sailing somewhere. I grew up sailing Optimist and since the age of 10 I knew that I´d wanted to become a professional sailor. For me, sailing is a very special and unique sport in many different ways. Unlike our pro-colleagues riding race bikes or the triathletes or swimmers we have so much fun training. It´s a hard sport – but also full of fun and joy. I really love doing what I do. … says Magnus Rassy of Hallberg-Rassy. He likes to talk about Hallberg-Rassy but is careful with statements on other brands. From his point of view there is no Scandinavian Yacht at all because it is built in the northern European Countries. But Niels Jeppesen of X-Yachts Denmark has a different opinion on that question. Niels: When I grew up during the Sixties and Seventies a new material was introduced to boatbuilding: GRP, or Glass reinforced Glassfiber. It was all new and we´ve had one of the first Danish yards in Stubbeköbing where such boats have been built. In fact, I went to school with one of the sons of the yard owner. In the same time Denmark was one of the most successful sailing nations – let me mention Paul Elvström here with four Olympic medals – which created some kind of a nimbus or image: Danish – or Scandinavian – yachts were synonymous with boat which could be sailed fast, hard and which were strongly built. 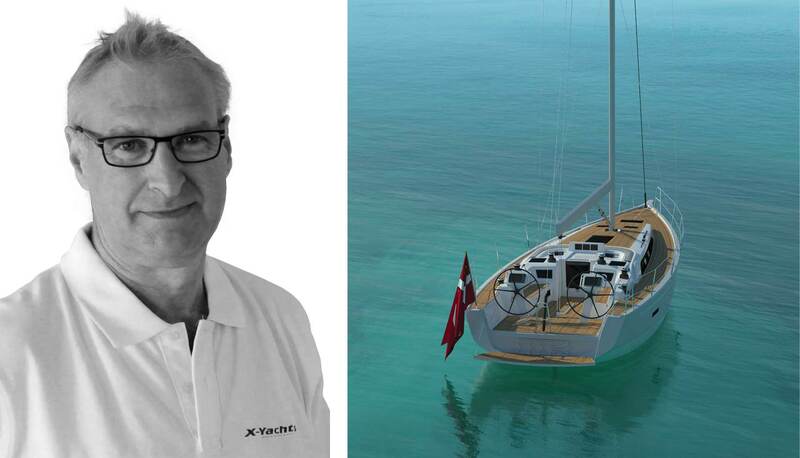 Niels Jeppesen: Founder of X-Yachts and enthusiastic about building yachts. Niels: So effectively, Nautor´s Swan, Hallberg-Rassy, Baltic Yachts, Najad and finally X-Yachts as well were and still are among the most respected brands and boatbuilders on the world within the quality-brand range. I think that´s because we do build yachts to a certain quality – not to a certain – low – price. Nicolai: I can agree to Niels´ assessment, but I want to add that that the “Scandinavian Approach” to sailing has always more been a way of seeking relaxation and joy. We Northeners love to travel around our nice coastlines with our families. We love night sailing with friends – and beer – and we do grow up not very far from the water. I think this is reflected by the style of boats and yachts built by Scandinavian manufacturers like Hallberg-Rassy for example. NFS.com: Yachts made in Scandinavia have a very high image in the whole world, yachts made by X-Yachts or Hallberg-Rassy don´t suffer from impairment such as other brands do. Scandinavian ships have a reputation of being especially seaworthy, sleek and sportive. Would you three agree on that? Magnus: No, not really. There are all sorts of boats built in Scandinavia. Maybe this image is because the big brands shine over the smaller ones, but we pretty much have the whole variety of boats and yachts made here. Hallberg-Rassy for example has been very consistent in what its yachts are standing for: A classic, stylish look and well built in every aspect of the ship. Nicolai: That´s what I would agree to: “Our” boats are more known to be wide, clumsy and non-sportive I fear. As a pro-sailor I do have maybe a rather brutal view on this topic, but they are not sportive in a sense like I would determine it. They are great boats, certainly, but it´s about recreation not about racing. 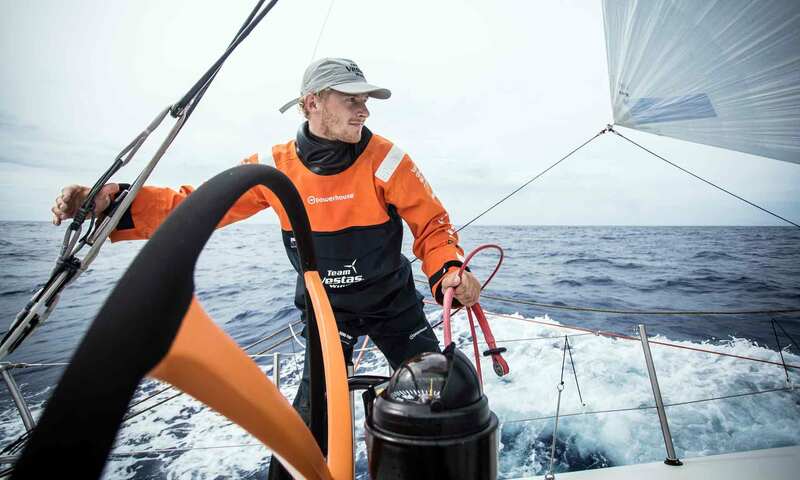 Nicolai Sehested is one of the Danish shooting stars of pro-sailing. NFS.com: … and maybe to not overtax unskilled weekend-sailors or the chartering hordes? Niels: … maybe, yes. Don´t get me wrong: Those yachts can sail perfectly well with fresh winds from astern or abroad. Especially when it´s fresh. But as soon as the wind eases – due to their respectively high weight – or turn to an upwind blowing right up front of the yacht, this “easy sailing pleasure” fails completely. These boats are pleasure machines but no good allrounders in my eyes. NFS.com: So, Magnus and Niels, what´s the DNA of your boats and the brand and how would you explain the core characteristics of a Hallberg-Rassy or an X to our readers? Magnus: Concerning our brand I think it´s a very rich history of well-built boats at first: We are present all over the world and everybody will instantly be able to recognize a Hallberg-Rassy as a Hallberg-Rassy. We have our typical design features such as the blue brim and a well protected cockpit. We take pride in our fine Teak decking and a nice, classy overall appearance. The yachts are built sturdy and with a high emphasis on having them well built. Finally we´ve acquired a reputation for building comfortable boats for easy and safe long distance sailing. “Easily recognizable” – a Hallberg-Rassy heeling upwind. NFS.com: Niels, do you like X-Yachts called “Performance Cruisers”? What is so special about an X-Yacht at all? Niels: That´s an easy one: X-Yachts are cruising yachts where we have made only a few compromises and curtesy to the demands of the “pleasure people”. That makes a X-Yacht able to compete in races as well as the boat of choice for a pleasure cruise as well. You see: A good sailing boat gets a large proportion of its stability from a keel with a deep center of gravity. Also, a boat needs to have enough sail area to move around when there is light wind. 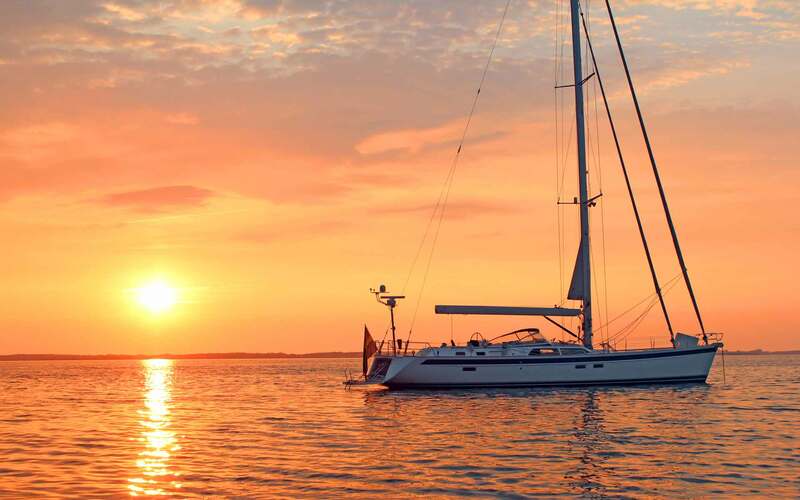 Quality rigging is another factor of so much more: Our Xp-range for example, such as the Xp 38, Xp 44 and so forth can all be set up to deliver a comfortable cruising experience. We do often outfit them with electrical winches, bow thrusters or heaters – yet at the same time these models are built with vacuum infusion to have the strongest possible hull. They do deliver high stability, come in with T-keel made of lead maximizing sailing pleasure as well as being able to race them hard. NFS.com: What is your dream yacht and why? Is it one the yachts you do produce in your own yard? Niels: When I was 23 years old the X 79 or X 99 were exactly what I saw as the perfect sailing yacht at that time. Every age has its own style I guess, so having turned 60 recently my focus is more on the cruising side and it´s indeed a great pleasure for me to sail our Xc-models. The Xc45 which we developed in 2008 is still my personal favorite, maybe topped by the upcoming X4 due launching here in a couple of months. It’s a super modern cruising boat where we pay a lot attention to details and maximizing sailing pleasure. X-Yachts are known for a fast yet pleasant cruising performance. 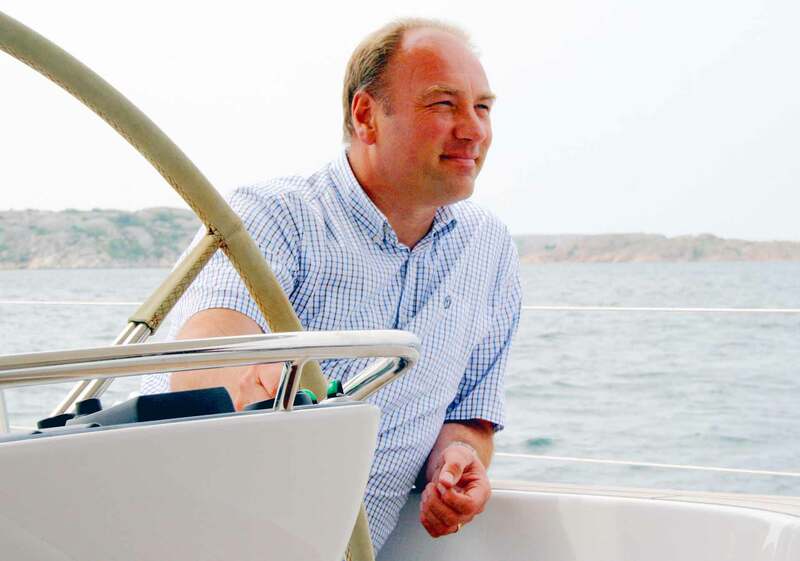 Magnus: I love developing sailing yachts and it´s of great pleasure for myself of being involved in this and having the chance to make boats the way I like to see them made. So my favorite is naturally always the latest Hallberg-Rassy model. Since these yachts in every detail stand exactly for the way I do love sailing and use a boat. On the other hand, knowing that other sailors may have other preferences or styles I do respect them having other brands or yachts as boats of their choice. That´s a natural thing. But asking me which boat is my favorite: It´s a Hallberg-Rassy of course. NFS.com: Magnus Rassy said that he can´t give a Top 5 of recognizing a Scandinavian ship, maybe Niels, do you have something for me? What do you think are the five points which stand out in this respect? Niels: Well, again I can only mostly speak for X-Yachts here: First of all, hull and more often deck-structures are built in full sandwich. 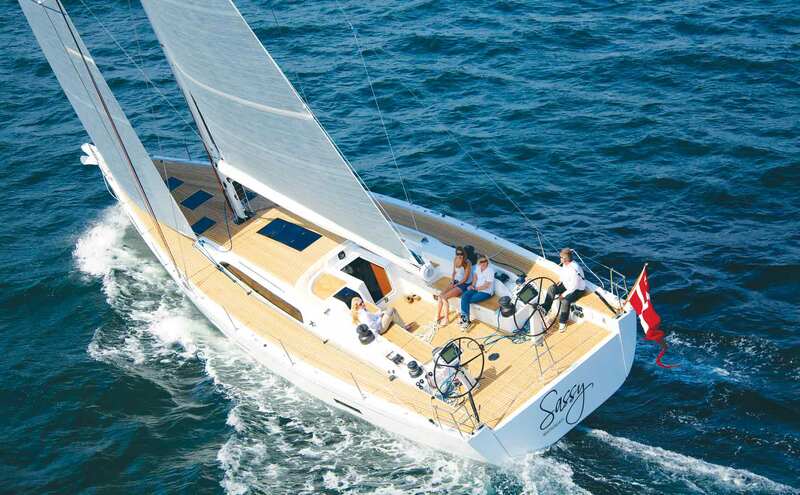 Nautor´s Swan and X-Yachts Xp-models are all built utilizing vacuum infused epoxy. Second is the keels in composite: The top-part is cast iron or welded high tensile steel and the bulb is made of lead – whereas the “others” would often use a fully cast iron keel which produced more drag. 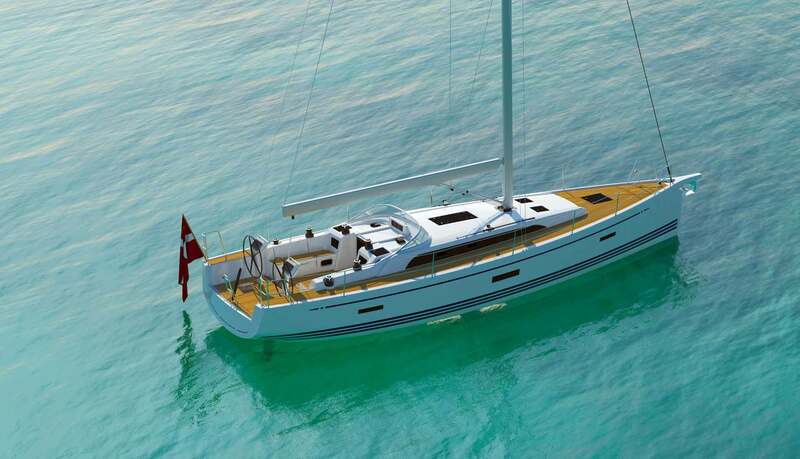 Third, maybe, the hulls are designed for maximum sailing pleasure, not for maximum internal space first. This of course results in the fact that these boats deliver much better sailing characteristics. 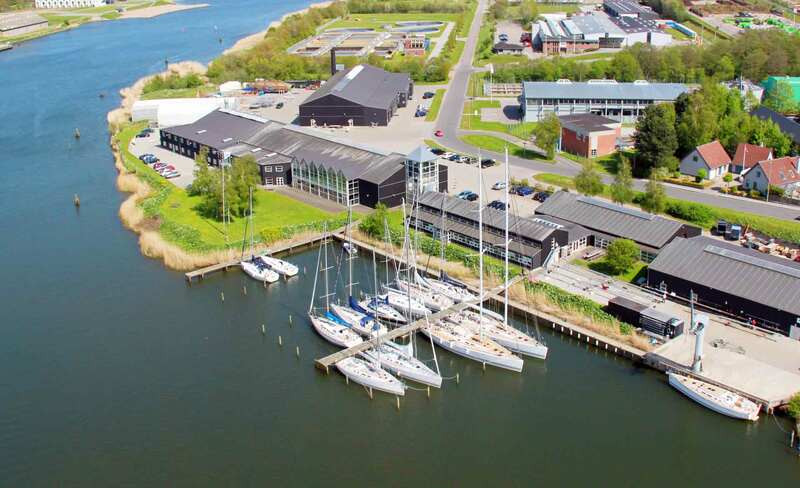 X-Yachts are made in Haderslev/Denmark. Niels: Fourth point – especially with X-Yachts – is that our deck layouts are thought through for sailing in rough conditions. That means – among other facts – that ergonomics are different, we do have higher back rests and thus less interior volume in the cabins under the cockpit which is giving more comfort and adds to the feel of safety here. Fifth, last but not least, in general I think more attention to details is paid. We do develop quality marine equipment together with manufacturers. This is why on many Scandinavian yachts this high quality equipment such as Gori, Flex O folding propellers, John and Selden Masts, BSI deck hatches or Ronstan deck fittings are standard. Not to mention Andersen winches or the Volvo Penta engines. … is a mix of well curbed brands, a marine history dating back as far as the Vikings, the regional demands which the North Sea, the Baltic and the island-rich coastlines have on the boats and dedicated boat builders such as Magnus Rassy or Niels Jeppesen. I think I´ve gathered a nice insight in the way the two are approaching this topic and place their yachts, the style and character within this wide range of images and brands. Judging from the performance of my own King´s Cruiser made by Fiskars in Finland and drawn by still active Pelle Petterson (Maxi Yachts) I would more tend to agree to Niels Jeppensen´s claims: In my eyes, Scandinavian boats are well made, sturdy and seaworthy ships of quality with an emphasis on performance rather than on being cheap and affordable at every cost. Niels´ most beloved project of the recent times: The X4 is due launching later this year. Thank you so much, Magnus and Niels for answering my questions and thanks to Nicolai for his view as a pro-sailor. Next Post	Yacht´s Lavatory: My Plans for the Head.